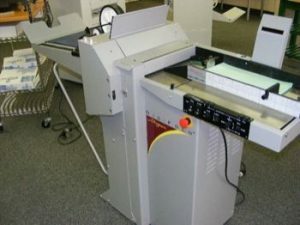 Second hand Morgana DigiFold MK1 Creasing and Folding machine. Machine has recently been refurbished by a Morgana technician and is in good condition. Complete with suction feeder, automatic set-up and max 1500 sheets per hour. Selling price $8,750 + GST with one months warranty and delivery in Sydney metro area. Please contact Roy West on 0418293621 for more information. NB. Photo is a file copy and not the original machine.